Friends members can renew their membership online. Follow the written instructions in this column to renew your membership. You may want to print them out to refer to as you complete your renewal. The images in this column are examples of where you click. They are NOT the actual renewal links. Account password. Don't know your password? CLICK HERE to set-up or request a password reset via email. Login using your email address and password. The Login button is at the top right of every page. 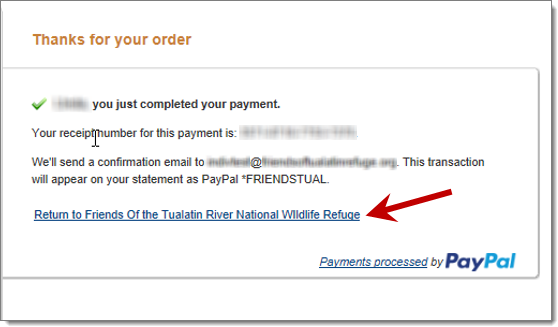 If you forgot your email address, send a request to membership@friendsoftualatinrefuge.org to have it sent to you. This is what the login box looks like. You will find it at the top of this page. Scroll up to see it. 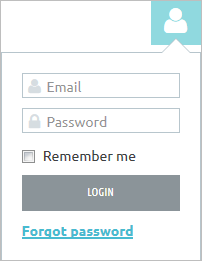 Once logged in, click the Login button again and then click the View Profile link in the login box. To renew at the same membership level click the Renew To <<date>> button. Go to Step 4. Alternatively, you may be presented with an opportunity to change to a different membership level (this option is available if your membership has not expired). If you choose a new level, click the Next button to review your profile details and then click Update and Next. Click the Pay Online button. You will transfer to our payment processor site where you can pay by credit card or with a PayPal account. You do not need a PayPal account to complete your transaction. When you've finished the PayPal payment process, click the link to return to your Profile page on the Friends site.